I have always loved trains. My childhood home in the Chicago area was two blocks from a freight train line and many nights I was lulled to sleep by the sound of train horns. I currently live not too far from a rail line and can occasionally hear the horns in the distance. I also love to travel by train (more on that in my next, and likely final, 2015 Vacation Destinations post). So when, in 2006 or so, I found out that an old section of freight train line on Manhattan was being repurposed as a public park, I knew that I would have to visit it. And on our last day in New York City, Alex and I finally had a chance to go. The High Line is on, as the name implies, an elevated section of railroad track. Originally, the freight trains that ran on the line were on the street level. After entirely too many accidents, the city decided to elevate the line. Trains ran on those elevated tracks from 1934 until 1980 (the final train to travel the tracks consisted of an engine and three cars of frozen turkeys). The tracks then sat unused for nearly 30 years. Work began on the park in 2006, and the first section opened to the public in 2009. The plants chosen for the High Line are largely the same types of plants that grew along the tracks during the years when the High Line lay abandoned. There are lists of the plants used, but the list is kind of overwhelming. 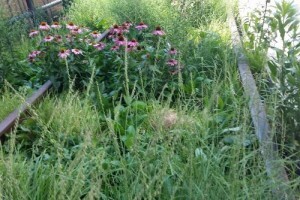 For example, they used four different varieties of purple moor grass. The Friends of the High Line website has a more easily digestible way to get to know the plant of the High Line through the “plant of the week” tag on their blog. I write these weeks ahead of time and schedule them for later, so the most recent plant of the week as I write this is goldenrod. If you look at the website and go back to that post, be prepared for a picture of what you likely will immediately identify as ragweed. Both plants flower at the same time, but they’re very different. The big plumes of yellow flowers are goldenrod. The ragweed that makes so many of us with hay fever miserable, is a much less exciting plant with little green flowers. In some places (see image below), the plants are placed alongside the original rails of the line. Purple coneflower and wild grasses along the rails of the High Line. In addition to the plants, the High Line is home to a number of pieces of public art. It is, of course, all modern art; so far no one has bought a Renaissance sculpture and donated it to the park, nor has it been there long enough for the works to become “classical.” I admit that I don’t really “get” much in the way of modern art, but I actually liked this. I think the setting made it somehow more accessible than I usually find modern art in a museum setting. If that makes any sense. The neighborhood around the High Line was interesting, as well. We watched them constructing a new high-rise apartment building near the entrance where we climbed up to the park, and at one point, we walked past the High Line Hotel, which is in the building that once housed the General Theological Seminary (which, in turn, was built on land donated by Clement Moore, the author of “A Visit from St. Nicholas”). The park passes over and goes through the art gallery district in Chelsea. At one point, we needed to go back down to street level and we happened to pass the Heller Gallery, which had an exhibition of Luke Jerram’s glass microbes. I had seen photos of Jerram’s work, but had never seen any in person. The man behind the counter was very gracious to two tired, sweaty tourists who just wanted to look around. Jerram’s work was just as beautiful as I expected it to be, but it is more than a little nerve-wracking to stand that close to a piece of glass worth more than six months’ pay at my job. The one thing that the High Line lacked was shade. The heat index was 100 (or slightly above) when we were there, and by the time we headed back down to the street level to take the subway to our hotel, I was longing for some kind of shade — a tree or some kind of shelter. There are trees in the High Line, but since the park is so young, the trees are still little more than saplings. Hopefully they did their planning correctly and someday those trees will be tall enough to provide shade to their visitors. That time has not yet come, however. The High Line is wheelchair accessible. Six entrances, Gansevoort and Washington, 14th Street, 16th Street, 23rd Street, 30th Street, and 34th Street and 12th Avenue, have either an elevator or a ramp. We were unable to find the 34th Street entrance to the park, but they were doing some sort of construction, so I suspect that the entrance may have been blocked off temporarily the day we were there.